Sorrento lemons are a medium to large variety with an oval shape, each end tapering to a point. The stem end may have a more prominent neck, and the opposite end will always display the typical, protruding mammilla. The highly fragrant rind is thick and somewhat bumpy, with visible oil glands. The translucent yellow pulp is aromatic, very juicy, and has very few to no seeds. Sorrento lemons have a somewhat tart, acidic flavor without any bitterness. Sorrento lemons are available year-round with a peak season in the spring through late fall months. The Sorrento lemon, also known as Limone di Sorrento or Ovale di Sorrento, is an Italian variety of Citrus limon. The fragrant lemons are cultivars of the oldest and most important lemon group in Italy: the Femminello-types. The lemons were named for the characteristically female protrusion opposite of the stem end. An older name for them is Sfusato, meaning “spindle” in Italian, a reflection of their shape. There are many named varieties, depending on the region in which they are grown. True Italian Sorrento lemons are grown within a protected region of origin on the Sorrento Peninsula and island of Capri in southern Italy, and are labeled with a sticker indicating such. Outside of this protected area, Sorrento lemons are grown under the name Femminello Ovale or Femminello Santa Teresa. Sorrento lemons are an excellent source of vitamin C and a good source of folate. They are also a source of potassium, magnesium, phosphorus and calcium. The vitamin C in lemons provides antioxidant benefits, and is vital to a healthy immune system. Lemons contain high amounts of the compound limonin, which research has shown has cancer-fighting properties. The large, Sorrento lemons are used for their zest, rind and juice. Most often, Sorrento lemons are used for making limoncello. They are also halved, salted and preserved for later use. The fragrant lemons are used to make jams, preserves and custards. The rind and pith are used to make candied lemon peel, or used to infuse vinegars and oils. 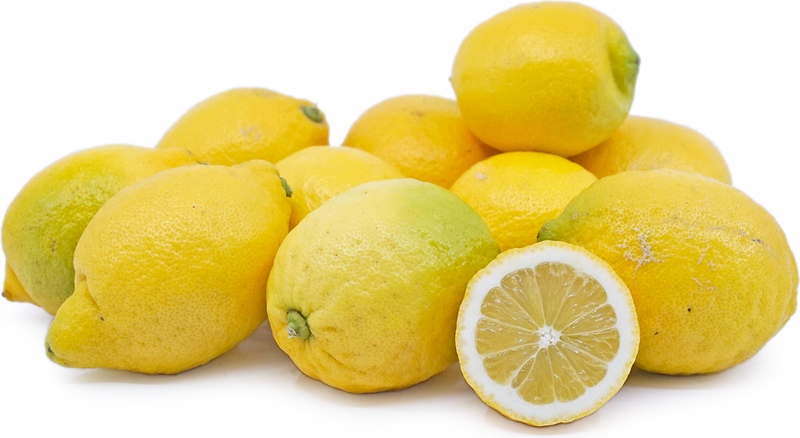 Halved or quartered Sorrento lemons can be roasted alongside meats, fish or vegetables. The aromatic zest will add a tangy citrus flavor to anything from baked goods to savory dishes. In Italy, it is often added as a finishing touch to risotto or pasta dishes. The juice can be used for marinades, beverages, sorbets, and other desserts. Store Sorrento lemons at room temperature for up to a week and refrigerate for longer shelf life. Lemons have a long history of being revered in Italy. Some families along the Amalfi Coast have been growing Femminello-type lemons for six generations. In the Campania region lies the ruined city of Pompeii, where frescoes and reliefs of the large, fragrant lemons remain, centuries after the eruption of Mount Vesuvius. For centuries, Sorrento lemons have been the primary variety used for making limoncello. 60% of all cultivated Sorrento lemons are reserved for making the sweet Italian liqueur. It is served cold, as an after-dinner or between-course aperitif. Sorrento lemons are native to the Sorrento Peninsula and the nearby island of Capri, located south of Naples in the western region of Campania. They are believed to have been a spontaneous mutation found on a femminello lemon tree, near Sorrento during the 16th century. Lemons were believed to have first come to Italy via travelers along the Silk Road, though some believe it was Jewish immigrants who first brought them to the area in the 1st century AD. Jesuits in the area began cultivating the lemons in 1600. They have been grown there, and along the nearby Amalfi Coast for over 500 years. The unique soil and environmental conditions in the Campania region, along with the way in which the lemons are grown – on pergolas with protective nets, are what make these lemons special. They are even hand-harvested in many cases. In the early 2000s, the lemons of Sorrento earned their own Protected Geographical Indication recognition (IGP) and, through a dedicated consortium, are protected and marketed. Outside of Italy, Sorrento lemons are grown to a limited extent in Southern California. Recipes that include Italian Sorrento Lemons. One is easiest, three is harder.